20 years ago, according to order-decision number 744/119 of September 21, 1989 by the State Committee on Education and Presidium of the Academy of Science of USSR, the Scientific-Educational Center of SHS MISIS - ISMAN (SHS-Center) has been established in order to launch scientific integration of the State Technological University Moscow Institute of Steel and Alloys (MISIS) and the Institute of Structural Macrokinetics and Material Science Problems of Russian Academy of Science (ISMAN) in the field of Self-Propagating High-Temperature Synthesis (SHS). This order-decision determined functions and tasks, statute and structure of the SHS-Center. Idea of SHS-Center establishment was positively accepted by representatives of State Committee on Education (Prof. Gennady Yagodin) and Academy of Science (Academician Guriy Marchyuk) of USSR. Academician Alexander Merzhanov (founder of SHS and ISMAN) and Prof. Nikolay Khavsky (vice rector of MISIS at those period) were initiators of decision to establish firstly in USSR the SHS-Center on the base of both institutes integration. Prof. Inna Borovinskaya and Prof. Nikolay Khavsky were former scientific leaders. Dr. Evgeny Levashov (at present – Professor, Honor Doctor of Colorado School of Mines, Head of the Department of Powder Metallurgy and Functional Coatings of MISIS) is a first and present head of the SHS-Center. Nowadays the SHS-Center is a multidisciplinary scientific-educational center with a wide area of scientific activity: SHS, mechanical activation assisted SHS (MA SHS), physics of combustion, structural macrokinetic, material science of ceramics, intermetallides, composites and functionally graded materials, nanostructured materials, hard-wear-corrosionheat-resistant coatings, biocompatible thin films and coatings, nanodispersion strengthened coatings, surface engineering technologies i.e. magnetron sputtering, ion implantation, ion implantation assisted magnetron sputtering, pulse electrospark deposition (PED), chemical reaction assisted PED (CRAPED), attestation of mechanical and tribological properties and metrology of nanostructured surfaces. Every year educational activity includes graduate training in following courses: Physical-Chemical and Technological Principles of Synthesis of Inorganic Materials in Combustion Regime, Structural Macrokinetics, Technologies of SHS. Education and training of postgraduate students is achieved by their involvement in the research and development programs. Training also carries out in the frame of VINF (Virtual Institute of Nanostructured Films) (www.vinf.eu of EXCELL FP6 project). 27 staffs including 4 Dr. Sc. and Professors, 9 PhD and Assoc. Prof., 14 engineers and technicians, 6 post-graduates, 12 students are working now in SHS-Center. In the last two decades the SHS-Center has been awarded by a number of international awards in the field of SHS and surface engineering: CRDF, INTAS, NATO-Russia, EUREKA, ISTC, UK Royal Society, FP6, FP7. The expertise and research leadership of SHS-Center is evidenced by above 600 publications on mentioned fields of expertise in referees national and international journals, books, proceedings, and multiple patents and know-how on the technologies. The team of SHS-Center collaborates with leading research centres in the USA, Europe, Asia, and Japan. Staffs of SHS-Center are members of International Association on SHS (SHS-AS), Int. Committee on SHS, European Joint Committee for Plasma and Ion Surface Engineering EJC/PISE, International Advisory Committee of FGM, Int. Committee on Plasma Surface Engineering, Int. Committee on Metallurgical Coatings and Thin Films, Int. Committee of World Ceramic Congress CIMTEC. The SHS-Center is a current member of the Advanced Coatings and Surface Engineering Laboratory (ACSEL) at the Colorado School of Mines. Head of the SHS-Center Prof. E. A. Levashov is a editor-in-chief of Journal Non-Ferrous Metals – English issue of Russian Journals Izvestiya Vuzov. Tsvetnaya Metallurgiya (nmt.msisa.ru), Izvestiya Vuzov. Poroshkovaya Metallurgiya i Funkcionalnie Pokritiya (pm.msisa.ru) and a member of editorial boards of International Journal of Self-Propagating High-Temperature Synthesis and Physical Surface Engineering Journal. Characterization of Multicomponent Materials and Nanostructured Coatings Using X-Ray Diffraction, TEM, HRTEM, SEM, AES, SIMS, AFM, and XPS methods. Evaluation of Chemical, Thermal, Mechanical and Tribological Properties of Materials and Coatings on Micro- and Nanoscale Using Nanohardness Tester, Scratch and Impact Testers, Tribometers, Optical Profiling Systems, Complete System for Electrochemical Research, Microcalorimeter, Wetting Angle Measurement System, Optical Emission Spectrometers. Innovative approach to manufacturing lines of diamond containing segments production for cutting wheel and drills for build industry and stone treatment which was developed recently. Nanosized additives to metallic binder are used in order to improve in 2 to 3 times a working ability and service life of diamond tool. It was established the follow main purposes of nanosized additives: change the chemical potential of interface between diamond and metallic binder result in alloying by chemically active nanoparticles; disperse strengthening the binder by involvement of nanoparticles inside of grains (hardness and toughness growing); involvement of nanoparticles on the grain boundaries (decrease the friction coefficient in cutting zone). Multicomponent multifunctional (wear-corrosion-and heat-resistant) nanostructured thin films and coatings deposited by PVD using SHS-composite targets were developed. Nanostructured thin film in system Ti-Al-B-N with extremely small crystallites less than 1 nm was observed. Multifunctional bioactive nanostructured films (Ti,Ta,Zr)-(Ca,P,Si)-(C,N,O) for load-bearing metallic implants has been developed. Multilayer high reactive ability films and foils for thermal generator were proposed. Self-propagating high-temperature synthesis (SHS) is an alternative method, which provides a highly dense, uniform structure that exhibits required mechanical, thermal, and electrical properties needed for such composite PVD target materials. The control of chemical composition of the targets facilitates the deposition of multicomponent films with required composition. The principal difference between sputtering of composite targets and metallic or intermetallic targets is that, in the first case, the multicomponent uniform flow of both metal and non metal atoms and ions is realized from the target to substrate. SHS composite targets can be especially benefit for the deposition of multifunctional nanostructured thin films and coatings in which both metallic (Cr, Al, Ca, Ti, Ta, Zr, others) and nonmetallic (C, N, O, B, Si, P) elements are present. As has recently been shown, the process of sputtering of multicomponent targets can be more complicated than sputtering from single element targets due to either the preferential sputtering effect or target poisoning. During the last decade various SHS composite targets have been developed and synthesized for deposition of hard tribological films and biological films. In order to enhance the toughness and thermal-resistance (resistance to thermal-cycling during high-power magnetron sputtering) needed for PVD targets, functionally graded targets have been developed and manufactured. As an example, Figure 1 shows three layers functionally graded target with TiC0.5+Ca3(PO4)2 working layer, TiC0.5 intermediate layer, and titanium bottom layer as applied to deposition of biocompatible bioactive films. Tribological coatings are expected to demonstrate superior performance under severe cutting, stamping, and bearing conditions, being also resistant against humidity, corrosive environments, and temperature fluctuations. The desired properties can be achieved in hard coatings based on carbides, borides, and nitrides of transition metals by complex alloying with other elements such as aluminium, chromium or silicon. 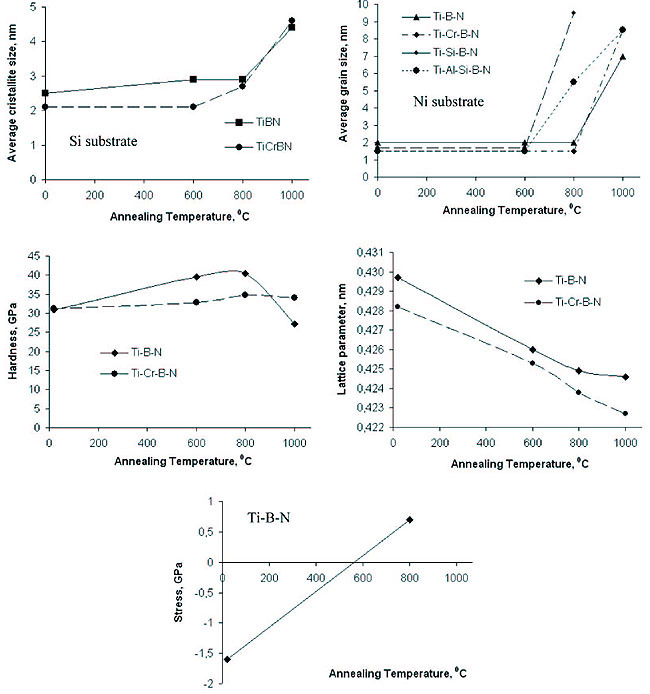 A comparative investigation of thermal stability, corrosion and oxidation resistance of Ti-B-N, Ti-BN-xCr, Ti-B-N-xSi, and Ti-B-N-x(Al,Si) films (x = 11–14 at%) deposited by DC magnetron sputtering and ion implantation assisted magnetron sputtering of composite targets Ti-B-N, Ti-Cr-B, Ti-Si-B, and Ti-Al-Si-B in a gaseous mixture of Ar+N2 has been recently presented [1–3]. The films showed either a cubic B1 NaCl-type structure (Ti-B-N and Ti-Cr-B-N) or a hexagonal closepacked (hcp) AlB2-type structure without texture (Ti-Si-B-N and Ti-Al-Si-B-N). The films were characterized by a very small crystallite size in the range of 1 to 2 nm (Ti-Cr-B-N, Ti-Si-B-N, Ti-Al-Si-B-N) or 2 to 4 nm (Ti-B-N). For all films deposited on silicon substrate, the crystallite size remained stable up to 800 °C (Fig. 2a). At an annealing temperature of 1000 °C, the crystallite size slightly increased to 4 to 5 nm. However, upon annealing in the temperature range of 800 to 1000 °C, the crystallite size of Ti-Si-B-N and Ti-Al-Si-B-N films deposited on nickel substrate rapidly increased (Fig. 2b). The somewhat lower thermal stability of the multicomponent nanostructured films deposited on nickel substrate was caused by the diffusion of nickel from the substrate into the film. Nevertheless, a threshold temperature for recrystallization depends on the film structure. Films with fcc structure acted as a diffusion barrier for nickel diffusion from substrate up to 800 °C. For films with hcp structure the onset of recrystallization was much lower, 800 °C for the Ti-Al-Si-B-N films and 600 °C for the Ti-Si-B-N films, due to the fast diffusion of nickel atoms between the basal planes of hcp structure. Upon annealing at 800 °C, the hardness increased up to 35 GPa (Ti-Cr-B-N films) and 41 GPa (Ti-B-N films) (Fig. 2c). These peaks of hardness after annealing at 800 °C were observed without substantial compromise in friction coefficient and wear rate. Both Raman and IR spectra of the as-deposited Ti-Cr-B-N film and the film annealed at 800 °C were quite similar. The changes observed in the spectra could be attributed to precipitation of h-BN, slight increase in grain size, decrease in nitrogen deficiency, and relaxation of compressive stress in the film. These can be taken as indications of short-range diffusion and elements redistribution between the neighbor phases. As a result, the lattice parameter of the Ti-B-N and Ti-Cr-B-N films decreased to a value typical for TiN (Fig. 2d). Although the stress was changed from compressive to tensile (Fig. 2e), the crystallite size and hardness of the films deposited on silicon substrate remained relatively stable after annealing up to 800 to 1000 °C. The oxidation stability of the Ti-B-N film was better than that of Ti-Si-B-N and TiN, but much lower than that of Ti-Cr-B-N and Ti-Al-Si-B-N films for which no traces of crystalline TiO2 phase were observed after oxidation at 600 and 700 °C . The formation of aluminum, silicon and bor rich oxide layers was shown to prevent films from further oxidation. After annealing at 900 °C, the Ti-Cr-B-N and Ti-Al-Si-B-N films formed several oxidation layers . Top layers were mainly consisted by TiO2 and Cr2O3 for Ti-Cr-B-N and by TiO2 and Al2O3 for Ti-Al-Si-B-N. In lower layers fcc-TiN phase was present. Electrochemical tests also demonstrated the advantage of chromium-doped Ti-B-N films over the Ti-B-N, Ti-Si-B-N, and Ti-Al-Si-B-N films in the 1N H2SO4 solution [2, 3]. The Ti-Cr-B-N films showed a more positive value of corrosion potential with respect to the Ti-B-N film and a four-fold decrease in the current density at a potential of passivation. In contrast, for the Ti-Si-B-N and Ti-Al-Si-B-N films the corrosion and passive behaviors were rather negative. The current densities for the Ti-Si-B-N and Ti-Al-Si-B-N films under the passive conditions were 6.6 and 14 times higher and the corrosion potentials more negative than those for the Ti-B-N film. Thus adding chromium in the Ti-B-N film results in the stabilization of oxide layer on the top of the film under anodic polarization conditions. High-temperature thermal stability, corrosion- and oxidation resistance of hard tribological films may be of great importance for high-speed and dry cutting applications. The lifetime of drills with Ti-Cr-B-N and Ti-Si-B-N films against 12X18H10T steel increased, while drilling time of one hole decreased in comparison with uncoated high-speed tool and tool with TiN film. 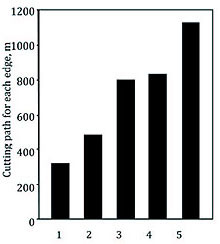 Comparison of lifetime of coated WC-Co mills and blades during milling and turning of D2 (Cr12MoV) and 321 (Cr18Ni10MnTi) steels respectively is shown in Figure 3. Tools with films showed superior characteristics in comparison with uncoated tools and tools with TiN film. The SHS targets based on the MAX-phases Ti2-xCrxAlC (where x = 0, 0.5, 1.5, and 2) can be successfully used to deposit nanostructured TiAlC(N), TiCrAlC(N), and CrAlC(N) coatings with enhanced characteristics, such as high hardness, low wear and friction, high thermal stability, oxidation and corrosion resistance . The most important results can be summarized as follows. The coating growth rate increased when chromium content in the target was raised. The coatings had lower aluminum concentration and aluminum/chromium ratio compared with those of targets used. With increased chromium content, the structure of as-deposited coatings changed from cubic to mixed structure consisting of cubic and hexagonal phases. The MAX-phase Cr2AlC was observed to crystallize in the TiCrAlC coating (Ti0.5Cr1.5AlC target, hereafter denoted as x = 1.5) deposited at a relatively low substrate temperature of 300 °C and high substrate bias voltage of -250 V. The as-deposited TiAlCN and TiCrAlCN (x = 0.5) coatings showed maximum hardness of 31 to 35 GPa. The TiAlCN coating also demonstrated stable low friction coefficient against WC-Co in the range of 0.15 to 0.25. For coatings with high chromium content deposited in Ar+N2, the hardness was well below 24 GPa and the steady-state friction coefficient values were in the range of 0.5 to 0.65. The TiAlCN and TiCrAlCN (x = 1.5) coatings showed the best thermal stability as far as phase transformation is concerned. Their cubic structure was stable in the temperature range of 20 to 1200 °C, while the structure of the CrAlCN coating underwent phase transformation upon annealing. The grain size of the nanocomposite TiAlCN coating only slightly increased upon annealing up to 1200 °C. In the case of the TiCrAlCN coating (x = 1.5), the grain size did not change after heat treatment at 800 °C but rapidly increased with further heating. The CrAlCN coating showed an increase in the grain size already after annealing at 800 °C. Upon annealing, the hardness of the TiCrAlCN (x = 0.5) and CrAlCN coatings decreased. The hardness of the TiCrAlCN coating (x = 1.5) increased from 25 GPa to 38 GPa reaching maximum value at 800 °C and then sharply decreased. The hardness of the TiAlCN coating only slightly decreased from 31 to 25 GPa and retained constant up to 1200 °C. The TiCrAlCN (x = 1.5) and CrAlCN coatings with high chromium content were more oxidation resistant and demonstrated better electrochemical behavior compared to the TiCrAlCN (x = 0.5) and TiAlCN coatings. The oxidation process was accompanied by a loss of nitrogen and diffusion of aluminum to the surface of coatings resulting in the formation of a layered structure consisting of Cr2O3, Al2O3, Cr7C3, and AlNxOy sublayers from the top to deep of the coating. The formation of aluminum-rich oxide layers prevented the TiCrAlCN and CrAlCN coatings from further oxidation. Comparison of lifetimes of coated and uncoated 8 mm diameter WC-Co end mills (SGS Tool Company, USA) in dry milling of chromium steel (X12BF brand mark, 52-53 HRC) is shown in Figure 4. The performance of the TiAlCN and CrAlCN coatings was compared with that of a commercial TiN coating which was used as reference. The milling tests were carried out on a drill-milling machine VF-1 (Haas, USA) under a rotation speed 1900 rev/min, feeding rate 150 mm/min, and allowance 0.2 mm. It can be seen that the lifetimes of end mills with TiAlCN and CrAlCN coatings were increased 2.5 to 3.5 and 1.7 to 2.4 times in comparison with uncoated tools and tools with TiN coating, respectively. Since the operation temperatures during milling did not appear to exceed 800 °C, which can be concluded from the absence of the coating color loss, the superior milling performance of the TiAlCN coating compared to the CrAlCN coating can be attributed to its better mechanical (high hardness) and tribological (low friction) properties. Low friction coefficient implies both decreased friction between the tool and chip in dry machining and reduced tendency to sticking and material pick up from the counterpart material which leads to the extended service life of cutting tools. Reduction of friction remains the main challenge for hard wear-resistant films. This is particularly true for films that work in aggressive environments and under the high temperature conditions. Solid lubricants such as dichalcogenides of transition metals of group VI are commonly used to decrease friction. As a solid lubricant, the WSex phase has an obvious advantage over other transition metal dichalcogenides due to its very narrow stoichiometric range 1.97<x<2, making this phase more resistant against oxygen penetration. As a result, the WSe2 films showed superior performance both in air and under water . Single-layer (SL) and multilayer (ML) TiCrBN/WSex films were deposited by ion implantation assisted sputtering of TiCrB and WSe2 targets . The SL TiCrBN/WSex film consisted of mixture of fcc TiCrBN, WSe2, and a-WSex phases. The ML TiCrBN/WSex film consisted of a sequence of nanocrystalline TiCrBN and a-WSex layers with thickness 85 to 110 and 11 to 17 nm, respectively. The SL TiCrBN/WSex films showed almost the same hardness of 30 GPa as the TiCrBN film. The incorporation of WSex into TiCrBN film was shown to decrease the friction coefficient in air from 0.5 to 0.2 to 0.25 with only little influence on the wear resistance. In the case of SL TiCrBN/WSex films, the friction curves were typically flat with a very short running-in stage which did not exceed 50 m, whereas in the case of ML films, the fluctuations and spikes of friction coefficient were observed indicating that the transfer layer was not stable (Fig. 5a). This was probably caused either by discrete re-supply of solid lubricant from under-layers into the friction contact or/and by periodical detachment of the wear debris. Analysis of the wear track morphology revealed smeared regions inside the tracks indicating the formation of tribofilms at the sliding interface and the volume fraction of smeared regions increased as the tribological test proceeded (Fig. 5b). It has been confirmed by Raman spectroscopy that the existence of WSe2 phase in sliding contact during the total period of the tribological test provides low friction. There were structural changes in the bulk of the film due to the surface oxidation process under the friction contact, but the WSe2 hexagonal planes were not destroyed by oxidation. The transition layer containing WSe2, a-TiOx, and a-WOx phases was formed at the bottom of wear track and remained strongly adhered to the surface. The WOx phase appeared to form due to oxidation and transfer of the ball material. The level of wear rate of the SL TiCrBN/WSex films was comparable to the wear rate of hard tribological films . After annealing of the SL TiCrBN/WSex film at 550 °C for 1 h, the friction coefficient decreased further down to 0.2 and remained stable for 104 cycles (1 km) until the testing was stopped (Fig. 5a). The superior performance of the SL TiCrBN/WSex film after annealing can be explained by the presence of two constituents, of which one is a hard and hightemperature oxidation resistant (Ti,Cr)(B,N) phase with a grain size of a few nanometers and the other is a mixture of WSe2+a-WSex solid lubricant grains and inter-granular phases. The choice of the hard constituent can be critical. As was shown previously, the TiCrBN films possess improved oxidation resistance up to 900 °C . The electrochemical tests demonstrated that the open-circuit corrosion potentials of the SL and ML TiCrBN/WSex films had positive values in the range of 0.22 to 0.3 V, which correspond to passive state . Incorporation of WSex into TiCrBN film does not significantly affect the passive state of the film under anodic polarization conditions. In order to obtain artificial implants with enhanced physical, chemical, mechanical, tribological, and biological properties resulting in their accelerated self-adaptation in human body and long-term performance, it is necessary to combine the advantages of materials with various properties: biocompatibility, bioactivity, excellent corrosion resistance, high fatigue and bending strength, low modulus of elasticity and friction coefficient, high wear resistance. One of the possible solutions to the problem of producing load-bearing implants is to coat a film with multifunctional properties. A new approach to design perspective multifunctional bioactive nanostructured films (MuBiNaFs) for load-bearing metallic implants has been developed [13–18]. MuBiNaFs were deposited by magnetron sputtering of composite targets TiC0.5+X and (Ti,Ta)C+X (where X = CaO, TiO2, Ca10(PO4)6(OH)2, ZrO2, Si3N4, and Ca3(PO4)2) in an argon atmosphere or reactively in a gaseous mixture of Ar+N2. The application of the ion implantation assisted magnetron sputtering (IIAMS) of SHS-composite targets offers a flexible approach to surface improvement of metal implants. This technique facilitates in the production of dense, well adhered films with controlled elemental composition. A comparison of MuBiNaFs with the properties of bulk materials (metals and alloys, ceramics) and thin films produced by alternative methods shows a noticeable advantage from the view point of the whole combination of physical, mechanical, tribological, and biological properties. The MuBiNaFs revealed a high level of bioactivity due to their nanocomposite structure with various functional groups on the surfaces. For instance, the films deposited in an argon atmosphere consisted of (Ti,Ta)C, TixOy, and CaO phases in an amorphous matrix with P-O, C-O, and O-H bonding. In the films deposited in a gaseous mixture of Ar+N2, apart from the (Ti,Ta)(C,N), TixOy, and CaO phases, the indication of diamond-like carbon, metallic tantalum and traces of P-O bonding were observed . As shown in Table 2, the MuBiNaFs are characterized by high hardness (H), reduced Young’s modulus (E), high percentage of elastic recovery, high resistance to plastic deformation (described be the ratio H3/E2), and long elastic strain to failure (described by the ratio H/E). The last parameter is an indicator of film durability and wear resistance. As a hard tissue replacement, films with the low elastic modulus are particularly beneficial, especially if E can be adjusted to closely match that of the underlying substrate material (stainless steel, NiA, CoA, Ti) in order to minimize film/substrate interfacial stress and because the smaller elastic modulus can result in smaller stress shielding. Low Young’s modulus also allows better transfer of functional loads to bone. The MuBiNaFs showed stable low friction coeffi-cient in the range of 0.2 to 0.25 both in air and under physiological solution which is significantly lower than those of TiC and TiN films. The wear rate of the MuBiNaFs was two orders of magnitude lower than that of titanium substrate both in ambient air and under physiological solution. No noticeable wear of counterpart material was registered in both cases. The films have low dissolution rate under physiological solution and therefore are suitable for orthopedic and dental applications. In general, interfacial failure is one of the most predominant failure modes of coated implants. Resistance of various film/substrate systems to scratching was recently studied [15, 19]. It was shown that the resistance of film/substrate systems to scratching depends on the combination of elastic and plastic properties of both the film and substrate. From scratch tests, it can be concluded that the adhesion strength is high because the films deform either elastically or plastically without detaching from substrate until high critical load was achieved. Fatigue tests (bending with rotation) demonstrated that the fatigue limit of titanium roads, 7.5 mm in diameter, with Ti-Ca-C-O-N films was close to 350 MPa similar to that of titanium sample without the film. Contact angle measurements indicated hydrophilic nature of MuBiNaF surfaces. The electrochemical tests demonstrated that all MuBiNaFs had positive values of corrosion potential with low current density. MuBiNaFs also showed more positive values of potential than titanium that promote titanium alloy passivation. Zeta-potential measurements showed that the surface of all MuBiNaFs was negatively charged at pH values ranging from 4 to 10 and hence, could combine selectively with positively charged Ca2+ ions in body fluid to form calcium based intermediate phases that may further transform into apatite, because apatite is the stable phase in body environment . In vitro studies showed that cultured IAR-2 epitheliocytes, Rat-1 fibroblasts, and MC3T3-E1 osteoblastic cells were well spread on the surface of MuBiNaFs and their actin cytoskeleton was well organized. Osteoblastic cells had a high rate of proliferation on all examined films and expressed early-stage differentiation marker alkaline phosphatise. The MuBiNaFs revealed a high level of biocompatibility and biostability in the experiments in vivo. Implantation studies using rat calvarian and hip defect models indicated early signs of bone formation on coated titanium implants. After one month, a close contact between the implant surface and cortical bone was observed without any bone loses at the interface . The results described above show that MuBiNaFs possess a combination of high hardness, fatigue and adhesion strength, reduced Young’s modulus, low wear and friction, high corrosion resistance with high level of biocompatibility, bioactivity, and biostability that makes MuBiNaFs promising candidates as protective films on the surface of metallic implants such as orthopedic prostheses, materials for connective surgery and dental implants. The method of CRAPED utilizes an exothermic reaction initiated by electric discharge within an inter electrode space [20, 21]. In this case, the discharge energy Qel must be comparable with (or greater than) the reaction heat Qch. The TRESS process can be carried out in the three modifications shown in Figure 6. In the modification shown in Figure 6 as CRAPED 1, an electrode filled with a reactive powder mixture acts as anode while a substrate, as cathode. During pulsed discharge, the powder material from the anode undergoes the exothermic chemical reaction .Ai + .Bj = Z + Qch within the inter electrode space. As a result, reaction products Z are deposited onto the substrate surface. Due to formation of a transition joint at the coating/substrate interface, the deposited coating exhibits a high adhesion to the substrate. In the modification shown as CRAPED 2, a copper electrode acts as cathode while a substrate, as anode. Reactive layer was deposited by brushing a suspension of a given powder in an aqueous solution of silicate glue. Pulsed discharge between the electrodes initiates local exothermic reaction whose products are then deposited as a coating. In the modification CRAPED 3 metal or composite (including nanostructured materials) or graphite electrode chemically reacted with substrate material. In every case, .Q = Qel + Qch. The fact that Qch ЎÝ Qel leads to an increase in the extent of conversion, release of thermal strains, and increase in the coating thickness. For example, Ni-Al electrodes were used in the form of powder compacts, while Ti-B, Ti-C-Ni-Al, Ti-C-Al, Ti-Al-diamond, and Ti-B-diamond electrodes were prepared by dragging the above powders into aluminum, steel, and copper shells. Ti-Si, Ti-Si3N4, Ni-Aldiamond, and Ti-Al-diamond mixtures were used to prepare the glued powder layers. Graphite or nanostructured cemented carbides anodes can be used in CRAPED 3. Titanium, nickel alloys and steel were used as substrates [22–25]. Structure, composition and properties of deposited coatings as well as the processes taking place at the electrode tip were investigated. Elucidated were the features of the deposition process onto different substrates. The weight gain of substrate was determined by high-speed filming of the process. Two models of the process have been suggested. 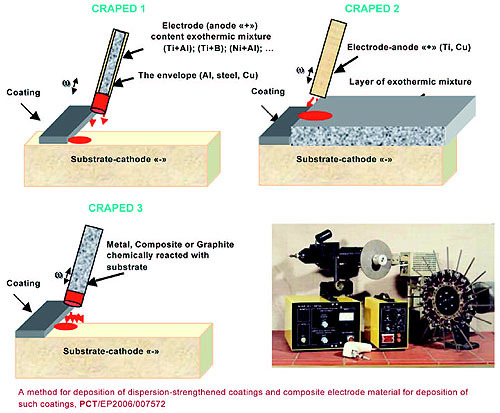 The material of electrode shell was found to affect the properties of CRAPED coatings. At some critical pulse discharge energy (Ecr), we observed the spontaneous ignition of electrode material or glued powder layer. Due to formation of TiB2, TiC, NiAl, TiAl, and Ti5Si3 during the deposition process, the deposited multifunctional coatings were found to exhibit a higher hardness and heat/wear resistance as compared to those of substrate material. CRAPED coatings were found promising for subsequent deposition of diamond films by CVD [26, 27]. Compared to PED, the CRAPED process is more energy/cost-saving. Further advance in the PED technology requires the development of new process equipment and new electrode materials (EMs) that would ensure deposition of coatings with improved service parameters. Nowadays, the electrospark modification of surfaces is carried out using WC-containing hard-alloy EMs of such brands as VK (WC-Co), TK (TiC-WC-Co), and TTK (TiC-WC-TaC-Co). Less popular are such W-free hard alloys as TN (TiC-Ni-Mo), KTN [Ti(CN)-Ni-Mo], LKTs [TiZr(CN)-Ni-Mo], etc. The drawbacks of the above alloys are (a) their high erosion resistance (hence low deposition rate) and (b) relatively low heat/corrosion resistance. As a result, the discharge energy is spent largely on the warmup and local melting of anode material. This leads to a low carbide content of the coating and a high amount of binder. The ES coatings deposited with standard WC-containing electrodes normally exhibit low hardness and wear/heat resistance, high surface roughness, high friction coefficient, and also the presence of discontinuities and defects. In this context, we have suggested a novel approach (other than powder metallurgy) to production of promising tungsten-free hard alloy EMs by SHS. It was found that the addition of refractory nanosized additives into a starting SHS mixture markedly modi-fies the structure of SHS product (to be used as EM) and hence the service characteristics of the coating deposited with such electrodes onto different substrates (such as titanium and nickel alloys, steels). The following SHS-produced hard alloys were used as a base of EMs: TiC-Cr3C2-Ni (STIM-3B), TiC-Ni (STIM-2), TiC-Ni alloy KhN70Yu (STIM-2/40NZh), TiC-NiAl (STIM-40NA), TiC-Ti3AlC2 (STIM-40A), and TiB2-TiAl (STIM-9/20A), and others. Nanosized powders of ZrO2, Al2O3, NbC, Si3N4, W, Mo, WC, WC-Co, and diamond were added to a starting SHS mixture [28, 29]. We characterized the structure, composition, and properties of PED-coatings and investigated the effect of nanosized additives on the process of mass transfer and properties of deposited coatings. The PED-coatings deposited with dispersion-strengthened EMs exhibited elevated hardness, continuity, thickness, wear/heat resistance as well as a lower grain size, friction coefficient (Kfr), and surface roughness (Ra, Rz, Rmax). 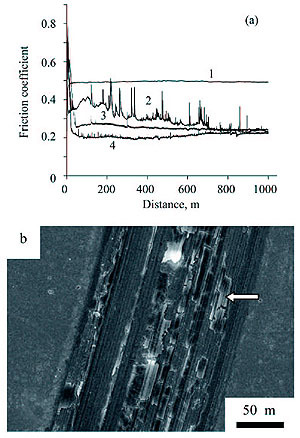 As is seen in Figure 7, the coatings deposited onto a titanium alloy with TiC-Ti3AlC2 electrodes are formed by Ti(C,N) grains (70 to 500 nm in size) formed upon recrystallization of finer grains. Measured adhesion strength (critical load) of coatings to the substrate is a very high. Indentation (diamond indenter, F up to 130 N) of the coatings deposited onto a titanium alloy with TiC-NiAl-NbCnano electrodes did not display any signs for exfoliation/detachment of deposited material. The elastic recovery was found to have a value of 40 to 50 %. It has been demonstrated that the PED-coatings deposited with dispersion-strengthened EMs exhibit improved service parameters.